Our condominium is thoroughly renovated and superbly equipped with premier quality furniture, linens, and kitchen ware. See 2 minute+ video of the unit and surrounding area - click on the third photo. Features include granite kitchen countertops, hardwood floors, and original black & white photography. There are six units in the historic 1903 Territorial style complex (3 buildings). Rental information is available through our manager, Austin Smith, at 970.769.8684. The kitchen has a full assortment of dinnerware, cooking utensils, and condiments for cooking. Excellent local restaurants include Snooze, Work & Class, Piattis and Hillstone (both in Cherry Creek Shopping area). Also see guest book for restaurants recommended by guests. Austin Smith provides management of our historic Curtis St condo. Call him at 970.796.8684 for questions re a direct rental of the unit. He will meet you at our unit for check-in, maintenance and emergency calls. The added full-sized air mattress is 75"Lx54"Wx9"H. This has an electric inflation pump that takes ~2 minutes to inflate. It is stored with pillows, sheets and blankets in the corner closet on the left side beyond the washer-dryer closet. Austin can show you how to set it up. If you ever have a problem with your rental and can not contact Austin, feel free to contact me personally. - owner - Art Sands MD at 970.481.0527 or dr.sands@comcast.net. Each unit has a back deck leading into a common garden area. The decks and common area are enclosed with gates and a 6 foot security fence. You are four blocks from the Denver light rail, which can take you downtown, to a good portion of the rest of the city including directly to the convention center. The area is designated a historic district and is the oldest existing neighborhood in Denver. Extensive renovations of Victorian era property are taking place in the area as well as new town home and condominium projects. There is ample safe parking on the street in front of the unit or on the side street. We leave two hybrid commuter bikes with helmets at the unit. This is a superb means of transportation including exploring this historic part of Denver. There are numerous bike trails throughout the city. We live in Fort Collins which is an hour north of Denver. Our middle son lives in Denver. We try to spend several weekends a month in this great city. Our youngest son is in dental school at the U of Colorado in Denver also. At the current time, our active manager is Austin Smith. He will be making your reservations and assisting you in your stay at 2606 Curtis. You can call him at 970.769.8684 for answer to your questions. We visit our sons, their wives and spend time with numerous friends made during 4 years of medical school(U of Colorado)and 10 years of playing rugby with the Denver Highlanders. This is an excellent location in an interesting historical neighborhood. We have made friends with many of the neighbors. The families of a number of the locals have been here for up to three generations. We are on the northern edge of downtown Denver (Lodo). There are numerous excellent restuarants, museums, and other interesting places to visit. The Fastracks station (light rail) is four blocks from our unit. You can also walk, ride the commuter hybrid bikes we keep in our condo, or take a taxi to local destinations. Denver has an excellent system of bike trails. We have found biking to be unbeatable for exploring the city and its many interesting places. See numerous comments from other visitors. Table with chairs inside and outdoor deck with chairs and gas barbecue grill. Clean and well maintained home in great walk-to location. Comfortable bed and whisper quiet home in quiet neighborhood. Walk to lively bar and restaurant scene within 3 blocks. Walk to heart of downtown, library/museums in 25 minutes. Light rail station to airport about 1.2 miles from location. This place is great! It's within a quick walk to restaurants, bars, coffee, and whatever else you'd want. It would be nice if the weather cooperated with us to be able to use the bikes and the patio, but it was not to be! Regardless, the place is great and the manager, Austin, was fantastic to work with. We'll stay here next time we're in Denver! Clean, quiet, safe, well apportioned, and comfortable 1 bedroom in a great location. 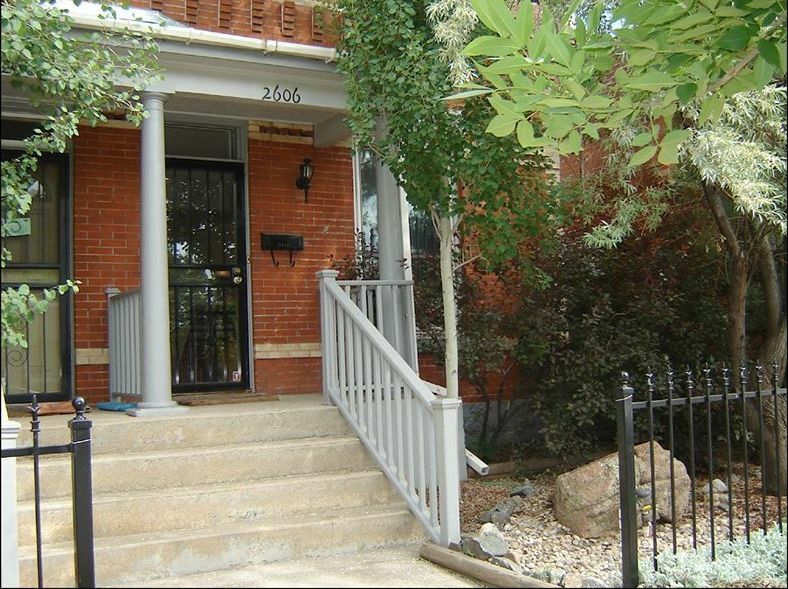 Walking or biking distance to downtown Denver and around the corner from great restaurants, cafes, & bars yet tucked into the Five Points residential area for a nice sense of privacy. Two bikes come with this rental. We stayed 5 nights and will definitely stay at this VRBO again. We were greeted by caretaker Austin who was courteous, flexible, and accommodating. Highly recommend! Good location, enjoyed the gas fireplace in February, and the bikes on the one day it got above 40 degrees! We were able to walk all around downtown. Also, the RTD station on the airport (A) line ( 38th and Blake) was only about a mile walk. We had no need for a car. Kitchen was obviously a working kitchen - had everything we needed. This place was great! Austin was very hospitable when we checked in and helped map out some choice . Great location very clean. We enjoyed every minute there. Lovely apt, very convenient location. My husband and I enjoyed our 3 day stay in this lovely apt ! It had everything we needed, plus an extremely comfortable bed. The apt. is in a transitional neighborhood, but only blocks away from some great restaurants. Denver Short Term Rental License (STR) # 2017-BFN-0001562 We will refund 100% of your paid fees if cancellation is at least 30 days prior to stay, 60% if cancellation is at least 12 days prior to stay. If renting a car during your stay in Denver, ask about our special offer on Enterprise car rentals. Perhaps we can save you lots! Your discount number will be on your confirmation if you plan to rent a car.